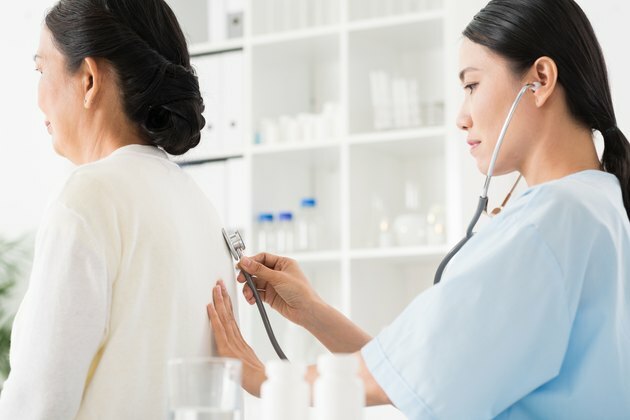 Lung crackles are abnormal breath sounds heard with a stethoscope during a physical exam. Crackling in the lungs usually reflects a buildup of fluid, mucus or pus in the small airways. This is commonly due to lung disease, such as pneumonia or another respiratory disorder. Crackles can also develop with heart ailments that lead to a backup of blood flow between the lungs and heart. A detailed medical history, blood tests and imaging studies can help sort out the cause of lung crackles. Lung infection is a leading cause of crackling in the lungs. Bronchitis, for example, causes airway irritation and inflammation with increased mucus production that can cause lung crackles. Acute bronchitis is most often due to a viral infection, causing a wet cough that last for up to 4 weeks. Pneumonia is a viral or bacterial infection of the lungs that extends to the air sacs, where gas exchange occurs. The infection leads to pus and mucus accumulation in the air sacs, with accompanying crackles. Other common symptoms include a wet cough, shortness of breath and fever. Weakening of the heart muscle due to a heart attack, viral infection, a genetic disorder or another heart disorder can result in heart failure. As the pumping function of the heart worsens, blood backs up in the arteries between the heart and the lungs. The resultant increased pressure leads to fluid leakage into the lungs. Most people with significant heart failure initially feel short of breath because of this accumulation of fluid, known as pulmonary edema. During a physical exam, crackling can be heard in the lungs as fluid tends to shift during a deep breath. Obstructive lung diseases -- including asthma, chronic obstructive pulmonary disease (COPD), cystic fibrosis and bronchiectasis -- are characterized by ongoing airway inflammation and narrowing. These abnormalities interfere with normal exhalation, which results insufficient emptying of the lungs between breaths. This, in turn, leads to reduce intake of air during inhalation. Obstructive lung diseases typically cause wheezing but can also cause lung crackles, primarily due to excess mucus in the airways caused by ongoing airway inflammation. Shortness of breath and chronic cough commonly occur with obstructive lung diseases, especially if not well controlled. Interstitial lung diseases (ILD) encompasses a large group of more than 100 lung disorders that primarily involve abnormalities of the interstitium, the tissue that surrounds the air sacs. Ongoing ILD typically leads to scarring of the interstitium and lung stiffness. Most people with ILD have crackles in both lungs, particularly during inspiration. Common symptoms include shortness of breath and a dry cough. Some people develop ILD without an identifiable cause, which is known as idiopathic pulmonary fibrosis. In most cases, however, a cause can be determined. Reviewed by: Tina M. St. John, M.D. What Are the Causes of Shortness of Breath on Exertion? What Causes Hardening of the Lungs?